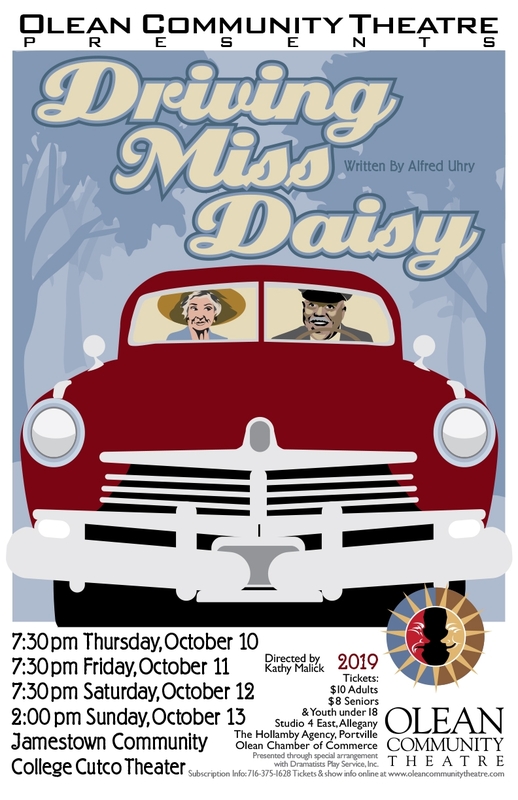 Olean Community Theatre presents "Driving Miss Daisy"
Olean Community Theatre presents "Driving Miss Daisy". The place is the Deep South, the time 1948, just prior to the civil rights movement. Having recently demolished another car, Daisy Werthan, a rich, sharp-tongued Jewish widow of seventy-two, is informed by her son that she must rely on the services of a chauffeur. The person he hires for the job is a thoughtful, unemployed black man, Hoke, whom Miss Daisy immediately regards with disdain and who, in turn, is not impressed with his employer’s patronizing tone and prejudice. But, in a series of absorbing scenes spanning twenty-five years, the two, despite their mutual differences, grow closer and dependent on each other. Performances will be held at JCC Cutco Theater. Tickets are $10 for adults, $8 for seniors and youth under 18. The Largest New York State Park is Allegany State Park which is the 3rd largest in the nation with 65,000 acres (97 square miles) and lots of trails. Allegany State Park has over 35 miles of Cross Country skiing trails, 18 hiking trails and 5.6 miles of paved multi-use trails (horseback riding, snowmobiling and more) around Red House Lake area. 3 campground areas with over 375 cabins.